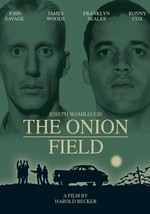 The Onion Field is a neo noir from 1979 based on the book by Joseph Wambaugh. Wambaugh was a Los Angeles police officer turned writer. He wrote two books before this, both made into films. He took a 6 month sabbatical from the force and wrote this classic. He soon had to leave the force after his notoriety got in the way of his job. With his bad experiences involving his previous works turned into films, he demanded to have full control of this film. He raised the money himself and made this film the way he wanted it made. We can thank Wambaugh for working hard to make a timeless classic, instead of another made for TV movie of the week. This film is based on a true story and Wambaugh did a ton of research and interviews to get this as right as possible in his book. The same care was done for the film with Harold Becker directing. This film starts out getting to know our two cops, Karl Francis Hettinger played by John Savage and Ian James Campbell played by Ted Danson in his first film role. We also get to know Jimmy Lee ‘Youngblood’ Smith, played by Franklyn Seales, who just got out of prison. He meets Gregory Ulas Powell played by James Woods, who has some “work” for Jimmy. They soon start robbing liquor stores and traveling between Las Vegas and Los Angeles to spend their spoils on guns and cars. The two pairs soon meet in a simple traffic violation for no tail lamps. Our thieves kidnap our cops by gun point and take them to an onion field in Bakersfield. This is were all hell breaks loose. Will our thieves get away with kidnapping? Will our cops escape? I don’t like to give away spoilers and will try my best on this one. I do want to mention that where most noir type films end, this one is just half over. We see what happens as the case goes to court and how this type of event affects our hard-boiled detective in the real world. All four of the leads are amazing in this film! Also look for a small roles played by Christopher Lloyd and Ronny Cox. Richard Herd also has a great small scene with a very strong monologue. This film has been on my “to watch” list for years and I finally got to it. Don’t be like me and put this to the top of your list right away if you have not seen it. This is one of the great neo noir films of the 1970’s and should be talked about more. It is an interesting story and I found the way it was told very neutral and honest. I liked the movie better than the book, but Wambaugh was an interesting writer. I read a couple of his books, including this one, and quite liked them — even though they weren’t my normal thing. I have another on my shelf that I must get to one day. I have not read any of his books, but after watching the film and some interviews with him on how he made this film and started writing books, I plan on giving him a try. his story makes him sound like one interesting writer. Great review! I saw this one soon after its initial release, so it’s been awhile, but I’m very eager to pick up the new Blu-ray release.